My father, Dr. Wayne Kimball, started our practice in the beautiful Sugar House area way back in 1952. I’m a native Utahn, born and raised the first 8 years of my life in South Salt Lake. My family later moved to the East Mill Creek area where I lived until enrolling at the University of Utah. It was there that I met and married a beautiful U of U co-ed named Robyn (from Holliday, UT) and we began raising a family of our own. Four children and eleven grandchildren later, we find our lives still amazingly challenging and incredibly rewarding. After achieving my BA in Psychology from the “U”, I enrolled at the Southern California College of Optometry, graduating in 1979. Shortly thereafter, I’ve received post-graduate training from the Pennsylvania College of Optometry in ocular therapeutic medicine. 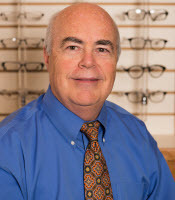 Over the years it’s been my pleasure to practice general eye care services, specializing in the detection and non-surgical treatment of eye diseases, contact lens services, and specialty eye wear. I’ve been involved in many leadership aspects of my profession and I’ve also had the awesome experience of participating in eye care service projects in South and Central America as well as in Africa. However, the greatest satisfaction I’ve received over the years is to have my eldest son Jory, become a third-generation Optometrist (practicing in West Jordan, UT), my second son Quinn, become the Executive Director at our clinic in Sugar House, and my only daughter Marissa, keeping us all on track by doing the clinic’s bookkeeping. Although not involved in the practice on a day-to-day basis, my youngest son Brady, is our “un-official” IT Director, as his skills in computer science are often called into action when we run into computer “issues”. Please know that it is our distinct joy and pleasure here at Sugar House Vision to assist you in looking and seeing better. While we take our responsibility very seriously, we also believe in having fun while accomplishing our goal of taking care of all your eye care needs. Thank you so much for your trust and loyalty in allowing us to do so.